This week’s anglers, a father and son team from upstate New York, never fished Panama before so we were eager to show them what Panama had to offer. After greeting them at the David Regional Airport in Chiriquí, we headed to the Come Fish Panama Lodge in Boca Chica for a little relaxation and preparation for some awesome offshore sports fishing the following day. 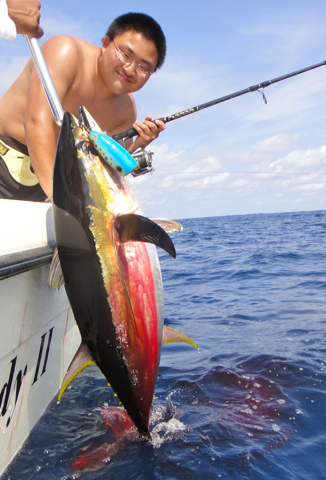 Scott is an avid angler and has fished in numerous places, but Panama had been a dream for him. We could readily see that he was excited to be here. After making bait, we headed straight to Wahoo Wonder for the morning Wahoo bite. But it was Mike who really did all the slamming, while Scott kept getting cut off. But that is Wahoo fishing as we well know. They enjoyed the Hoo’ action by boating several nice fish, so it was now time for a little bottom feeders and Snapper time over at “El Hueco”, which means “The Hole” in Spanish. At “El Hueco”, Scott and Mike jumped right into the action and the Mullet Snapper were all over their jigs and bait offering. We could actually see Mullet Snappers, Trigger Fish, Rainbow Runners, and Cubera Snappers feeding on small squid just below us in the clear water. As soon as the bait would hit the water, it was hold-on time with buckled knees up against the railing. The Cuberas would hit the bait hard and dive back towards the rocks, but Scott and Mike were up to the task. Some did break off, but that is pretty common when you fight a Cubera Snapper. They are super strong fish with a powerful tail and a mean set of choppers at the other end. The Mullet Snapper are no couch potato either. Catch a few of them and you will definitely feel your sore arms the next day. them with, so out came the Popping Rods and the Running and Gunning started. Scott did very well with the popper after landing a few. 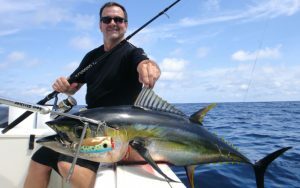 Mike, being new to this type of fishing, did well also and enjoyed it to the fullest. 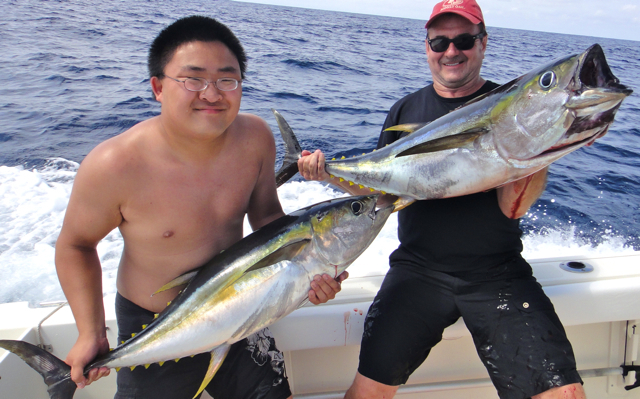 This Father and Son team had a great time with the Yellowfin. Their adventure was winding down, but you could still see the Tuna feeding just yards away. 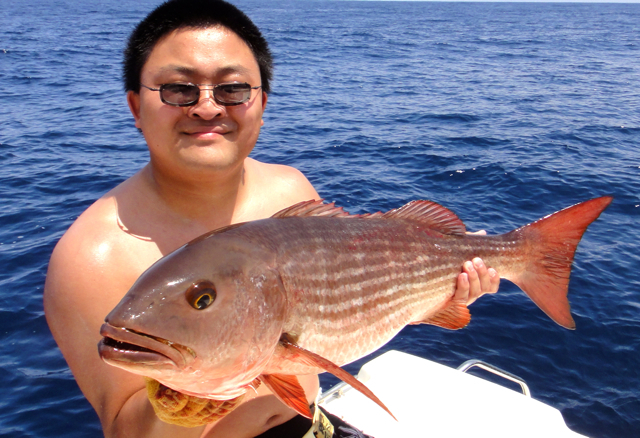 They were impressed with the great quantity of marine life above and below the surface, and understand why they call this place Anglers’ Paradise or National Geographic Country. On behalf of the Come Fish Panama Lodge team, I would like to thank Scott and Mike for choosing to offshore and inshore fish with us, as we know there are many other fishing operations to choose from in the area. 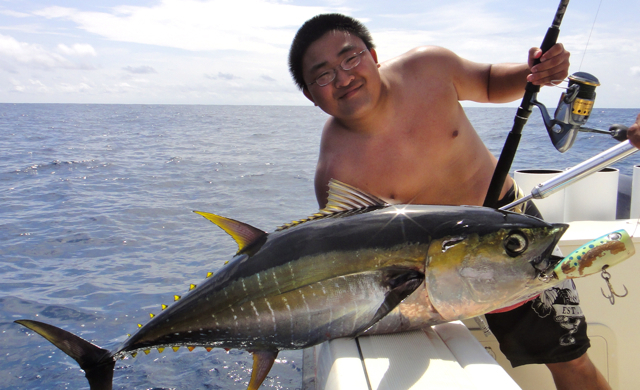 It was our pleasure to hook them up with the different species of fish during their short but productive adventure. We appreciate their business very much and look forward to seeing them again in the future. 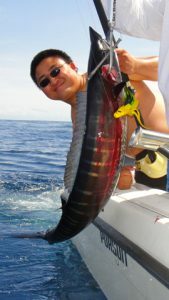 For more photos of these anglers, visit our “Fishing Photo” link on our website or at www.facebook.com/comefishpanama.